The Knicks have yet to win a game since losing Kristaps Porzingis to a torn ACL on Tuesdy and last night, in spite of playing a highly competitive game, with three of their players finishing in double double, they dropped 121-113 at Bankers Life Fieldhouse. Adding Emmanuel Mudiay in a three-way deal, which sent Doug McDermott to Dallas, proved to be a good move, even though the roster is now stacked with point guards. However, Jeff Hornacek played all four of them and the result was impressive. Mudiay made his debut wearing #1 on the jersey and posted a double double, with 14 points and 10 assists off the bench. He shot just 5-14 from the field after starting 3-3. He also made a three quarters of the floor shot at the end of the first quarter but the buzzer had already sounded. Jarrett Jack logged just 8 minutes but he might come off the bench after the All Star break. Trey Burke was also limited to 8 minutes. Frank Ntilikina however, got 31 minutes and he seems to love sharing the court with Mudiay. Ntilikina scored 12 points and finished with a plus- rating of 8. Michael Beasley finished with 16 points and 13 rebounds as a starter, while Enes Kanter and Tim Hardaway Jr. dropped each 17 points. Kanter also collected 11 rebounds. 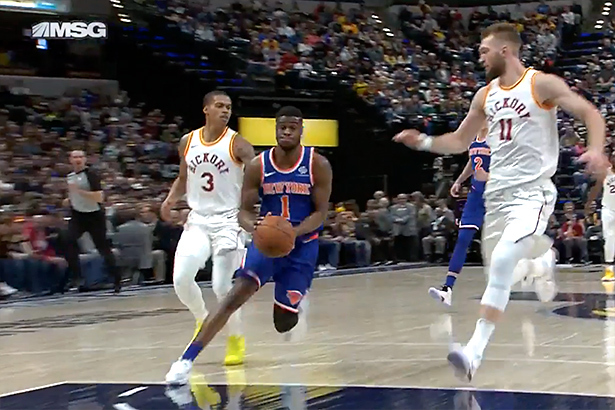 As usual, the Knicks played strong in the first half, then collapsed in the third quarter when they allowed the Pacers to take a 20 points lead. They tried to pull themselves together in the last act, cutting the lead to just six points with 70 seconds on the clock but couldn’t find an answer to stop Victor Oladipo. Oladipo led the Pacers with 30 points, 9 assists, 8 rebounds and 6 steals while Bojan Bogdanovic followed him with 20 buckets and 11 boards. The Knicks dropped 23-34 and will be hosted tonight by the Sixers.